My little niece came into the world on Sunday afternoon! We are all so glad she's here! So tiny, so soft and she smells so lovely. I held her for two hours while she slept and we watched a boring movie at the hospital. It's really scary holding a little tiny person for the first time. Becca had to show me the best place to put my hands and cradle her. I was all stiff and scared and very worried I wasn't holding her right. It's a great responsibility to have such a tiny life in you hands. I can't even imagine what the parents are feeling. Life is amazing! And I'm so lucky that they've let me be in on it all. 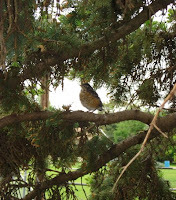 At the same time, the baby robins have finally hopped out of their nest and are jumping limb to limb - stretching and fluttering their wings while their tiny toothpick legs don't look strong enough to hold them up. It's pretty interesting to see the baby birds move at varying paces through the trees. One is definitely braver than his other siblings. By Wednesday morning they were gone. I didn't even get to see them take their first leaping flight. They sure do grow quickly. All day long their Mama brought worms and bugs to them - what a worker! Ahhh life in all its newness and wonder. The delicate newness of the little ones that come into the world, add to to it and are reminder of all that is good and beautiful in this world.